No he did not. It’s PLAINLY written on John Greens diagram. Trying to make sense of the goobly gook is neither here nor there. Thinker thunker went off the TC1 value John Greene wrote down......fact. So who is leading the evidence here Sweaty? The reason is because rays of light...(coming from 93 million miles away)...are running parallel to each other. When they pass by an object, they continue running parallel. No he did not. It’s PLAINLY written on John Greens diagram. Trying to make sense of the goobly **** is neither here nor there. Thinker thunker went off the TC1 value John Greene wrote down......fact. That "18"" number is not clear, Norse. The "1" is wavy, and ambiguous. What is clearer, and less ambiguous are the 8" and 12" numbers. And given the fact that trees TC-1 and TC-2 must be very close to the same width..and must be significantly narrower than tree TC-4....(marked as 12" in width).....the most probable, and most sensible scenario is a tree width scenario of "8"-12"-8"....(for trees TC-1, TC-4 and TC-2, respectively). 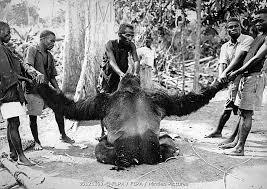 The tallest gorilla recorded was a 1.94 m (6 ft 4 in) silverback with an arm span of 2.7 m (8 ft 10 in), a chest of 1.98 m (6 ft 6 in), and a weight of 219 kg (483 lb), shot in Alimbongo, northern Kivu in May 1938. I have no problem with you shoulder width estimate Sweaty. I think your having a problem envisioning what an animal that leaves a 15x6 inch track looks like. I have no problem envisioning a creature of extreme height, or width, Norse. It's just that the evidence does not indicate it. I did. I have no problem with your 18” inch tree shadow of Patty’s back. It’s YOUR disbelief that MUST make the tree only 8 inches wide. Not really, Norse....it's John Green's measurement diagram that makes me think the trees are 8" wide. It very clearly says "8" for tree TC-2....(and 12", for TC-4). And TC-1 must be very close to the same width as TC-2....it's about the same distance away from the camera. I am simply following where the evidence leads. A five foot tall animal made those tracks? I’d say that there is no way either tree is 8 inches. So they must be 18 inches. I never said Patty was only 5' tall. I listed several different height indicators...and they all indicate a height somewhere around 6'. I’d say that there is no way either tree is 8 inches. That's great, that you can say that, Norse...but John Green actually measured the trees, and his diagram clearly says "8"" for tree TC-2. So they must be 18 inches. Then, what is the true width of tree TC-4....which is marked as 12", in John's measurement diagram?? But she's at 136 feet so 117.8 inches x 136/105 = 152 inches or 12.7 feet tall. If the tree is 8" instead of 18" then 152 x 8/18 = 67 inches or 5.65 feet. Methinks the truth is somewhere in between. There's either a problem with the camera lens or calculations that I don't understand or some measurements on the JG diagram are way off. I don't see how JG could confuse 12 inches with 30. My conclusion after a bunch of wasted time is that this method is badly flawed. editeed because some calculation fractions were wrong. I’m 6’2” tall, 260 lbs and I have a 11x4 inch foot...... so being 6 feet tall and having a 15x6 inch foot is unworkable as well. It’s marked 12 inches. That isn’t the problem. You have two trees marked 18 inches and 8 inches respectively. Only ONE value can be correct as the trees are obviously close to the same size. ONE of those values puts a 15x6 inch foot on a film subject that is somewhere between 5-6 feet based on Redbones calculations (8”)..... the OTHER value puts a 15x6 inch foot on a 7 ish foot tall film subject according to Thinker thunkers calculation (18”). Yah, I know which value makes a helluva lot more sense. If we are going to disqualify something on that diagram based on a squiggle line? You might as well throw the whole thing in the trash can. What are you referring to as "T12", Redbone?? Patty was not that far from the camera, as she passed behind tree TC-1....or when she passed behind tree TC-2. She was probably only a few feet behind TC-2 as she passed behind it....and that tree was 115' from the camera. So a more accurate figure might be around 115-120 feet from the camera, as she passed behind those 2 trees. I'm wondering, Norse....since you are proposing that TC-1 and TC-2 are 18" in width.....what would you say the width of tree TC-4 is? My T12 refers to the tree marked 12. You are calling it TC4 I guess. There is no reason to think that John Green made some major error/errors in his tree measurements, or in putting the measurements down on paper. John was very intelligent. He did a great job with the Jim McClarin re-creation walk...in having his camera's view of the scene match-up with Roger's camera's view. I think the best approach to working with his numbers, is to accept them....go with them....and see where they lead. Okay, thanks. I'm referring to it as TC-4, because that is how Bill Munns labeled it, in his diagrams. Clearly the two front trees are nearly the same in size. They are also both in the foreground. The 'big' tree in the background was measured at 12 inches. Scaling their widths does not help unless triangulating the distances with respect to the different widths can be done. it should go down as a ratio: distance to width, i.e. 162 ft. to 1 ft. (known width of large tree)= 105 ft. (small tree) to 'x' ft.. The difference in distance to the other small tree ('115) would still result in a width in the ballpark to match 'x' give or take an inch. Guaranteed one won't get 18". At Patty's distance she would have disappeared behind an 18" diameter tree or at least a very large portion of her. Note on shadows: A shadow cast by a certain object's width onto another object which is viewed from an angle will be viewed as being narrower than the object casting the shadow. The only true width of a shadow is when it is seen head on. the greater the angle of view the thinner the shadow. Even from overhead, the viewer should either be directly over the object or view the object and its shadow in direct alignment. When on the ground then only standing in the shadow of the object can one appreciate it's full width. The “Big tree” in the diagram most certainly was not measured at 12 inches? The big fir? 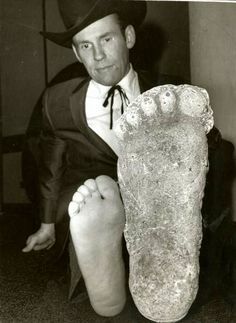 And I disagree that Patty as big as I think she is sporting size 22 feet would not have even remotely disappeared behind a 18 inch tree.....just as Thinker thunker shows in his analysis.